Israeli violations of international law and international humanitarian law, in the Occupied Palestinian Territories, continued during the reporting period (28 July – 03 August 2016). Israeli forces have continued to commit crimes, inflicting civilian casualties. They have also continued to use excessive force against Palestinian civilians participating in peaceful protests in the West Bank and Gaza Strip, the majority of whom were youngsters. During the reporting period, Israeli forces killed a Palestinian civilian and wounded 13 others, including 3 children and a young woman. Nine of them were wounded in the West Bank while the 2 others, including a young woman, were wounded in the Gaza Strip. In the Gaza Strip, Israeli forces continue to target Palestinian fishermen and chase them in the Sea. In the West Bank, in excessive use of force on 31 July 2016, Israeli forces stationed at Howarah checkpoint, south of Nablus, shot dead Rami ‘Awertani (31) from the same city when he stepped out of his car at an observation point in the track allocated for the cars coming out of the city. The Israeli forces claimed that ‘Awertani attempted to stab a soldier and his corpse was detained and taken to an unknown destination. It should be mentioned that ‘Awertani owns a barber shop on Annajah National University Street and a father of 3 children. On 30 July 2016, 7 civilians, including 2 children, were wounded when Israeli forces moved into Jenin and its refugee camp to carry out an arrest campaign. Meanwhile, a number of Palestinian civilians gathered where the Israeli vehicles were stationed to throw stones at them. The Israeli soldiers in response fired live bullets, sound bombs and gas canisters at the stone-throwers. As a result, 7 civilians were wounded with live bullets to the lower limbs and then taken to Dr Khalil Soliman Governmental Hospital in the city for medical treatment. On 02 August 2016, two civilians, including a child, were hit with rubber-coated metal bullets to the limbs. This happed after Israeli soldiers protecting settlers, who raided Joseph Tomb, east of Nablus, fired live and rubber-coated bullets and gas canisters at civilians who threw stones at the settlers. On 03 August 2016, two civilians were wounded to the limbs when Israeli forces moved into al-Far’ah refugee camp, southeast of Toubas. They patrolled the camp streets, and a number of Palestinian youngsters and children then gathered to throw stones and empty bottles at the Israeli vehicles. The Israeli soldiers fired for around two hours live and rubber-coated bullets at the stone-throwers, wounding two of them. In the Gaza Strip, on 29 July 2016, Samah al-Na’ami (38) was sustained a superficial bullet wound to her left shoulder while Mohammed al-‘Issawi (22) was hit with a bullet to the left foot. This happened when Israeli soldiers opened fire at dozens of Palestinian children and young men who headed to the border fence between the Gaza Strip and Israel, east of al-Bureij in the central Gaza Strip in order to throw stones at the Israeli soldiers. The aforementioned young woman was wounded when she was on her way to a field belonging to her husband near the border fence. In the context of targeting Palestinian fishermen in the Sea, on 01 August 2016, Israeli gunboats stationed off Khan Younis shore in the southern Gaza Strip heavily opened fire in the vicinity of Palestinian fishing boats sailing within the allowed area for fishing. As a result, the fishermen fled away for fear of being killed or wounded. However, no casualties were reported. On 03 August 2016, the same incident recurred in the northern and central Gaza Strip, damaging a fishing boat and losing fishing net. During the reporting period, Israeli forces conducted at least 78 military incursions into Palestinian communities in the West Bank, 6 ones in occupied East Jerusalem and its suburbs and limited one in Khan Younis in the southern Gaza Strip. During these incursions, Israeli forces arrested at least 81 Palestinian civilians, including 7 children. Nineteen of them, including 3 children and 3 women, were arrested in occupied Jerusalem. On 29 July 2016, ‘Izzat Kiswani closed down his coffee shop with steel plates in Sheikh Jarrah neighbourhood in Jerusalem to avoid closing it by the municipality that would also confiscate the contents. Kiswani explained that the court ordered him to close the coffee shop and gave him until the beginning of August to implement the order or its crews will close it and confiscate its contents. It should be mentioned the 180-square-meter coffee shop was built many years ago, and three families lived off the coffee shop. On 31 July 2016, Walid Shweiki self-demolished his house in Al-Thawri neighbourhood, south of East Jerusalem’s Old City, in execution of the municipality’s order and to avoid paying a 50-thousand NIS fine in addition to demolition costs. He added that he built his house in 2014 and moved in with his 3-member family. The municipality crews previously raided the house several times under the pretext of building without a permit until a demolition order was issued by the court. It should be mentioned that the house was built from “reinforced sheets” and comprised of two rooms and their facilities. On 02 August 2016, Israeli municipality bulldozers demolished a 600-square-meter car shop belonging to Mohammed ‘Elian under the pretext of building on a land confiscated for the interest of “Israeli Lands Administration (ILA)”. On 03 August 2016, Israeli bulldozers demolished 3 barracks belonging to ‘Eid Mohammed ‘Eid Barakat in al-Nabi Samo’eel village, northwest of East Jerusalem. One of these barracks was used as a women’s organization. On the same day, The Civil Administration crews along with Israeli forces demolished a residential caravan in Wad al-Dam area Beit Hanina neighbourhood, north of Jerusalem owned by Izz Eddin Abu Nijmeh under the pretext of building without a permit. Following the Friday prayer, on 29 July 2016, dozens of Palestinians and Israeli and international human rights defenders organised protests against the annexation wall and settlement activities in Bil’in villages, west of Ramallah. They commemorated the 1stanniversary of burning al-Dawabsha famil by Israeli settlers in Duma village, southeast of Nablus. They raised posters and photos of Ali al-Dawabsha, his father, Sa’ed and his mother, Riham. Israeli soldiers used force to disperse the protesters and arrested Hamza Ghazi Saleh al-Khatib (16) and solidarity activist Anat Lif. At approximately 13:30 on the same day, Palestinian civilians and Israeli and international human rights defenders organized a protest in the center of Kufor Qaddoum village, northeast of Qalqiliya, and then made their way to the eastern entrance of the village in protest against closing that entrance since the beginning of al-Aqsa Intifada with an iron gate. When the protesters approached the entrance, Israeli forces fired live bullets, rubber-coated metal bullets, tear gas canisters and sound bombs at them. As a result, many civilians suffered tear gas inhalation and no more incidents were reported. On 02 August 2016, Israeli forces established (3) checkpoints in Ramallah villages, including, al-Nabi Saleh village, northwest of Ramallah, Ein Yabrud village, northeast of Ramallah, the entrance to Deir Abu Mesh’al village and the crossroad of al-Taibah village ( the road that link between Ramallah and Jericho). The aim of these checkpoints was to search the cars and check the civilians ID cards. Israeli forces established (15) checkpoints all over the city. On Thursday, 28 July 2016, Israeli forces established 3 checkpoints at the entrances to al-al-Nabi Yunis, Tarama and Ethna villages. On Friday, 29 July 2016, Israeli forces established 3 checkpoints at the eastern entrances to Surif, Beit Ommar villages and al-Aroub refugee camp. On Saturday, 30 July 2016, Israeli forces established 2 checkpoints at the eastern entrance to Dora village and the southern entrance to Halhoul. On Sunday, 31 July 2016, Israeli forces established 2 checkpoints at the entrances to Kharsah and Tarama villages. On 01 August 2016, Israeli forces established 3 checkpoints at the entrances to Beit Ommar, Sa’ir and the northern entrance to Halhoul villages. On 01 August 2016, Israeli forces established 3 checkpoints at the entrances to Beit Ommar, Sa’ir villages and the northern entrance to Halhoul. On 02August 2016 Israeli forces established 2 checkpoints at the eastern entrance to Dora and al-Thaheriyah villages. Israeli forces continue to close the western entrance to al-Shuhada’ street in the center of Hebron leading to Tal al-Ramidah and prevented civilians who are not residents of the city from entering the abovementioned area, claiming that it is within the closed military zone declared on 09 July 2016. While the Israeli soldiers are protecting settlers, who cause fear among the residents due to their attack, the Israeli settlers attacked Abu Shamsah family under the leadership of the extremist female settler Anat Cohen. A PCHR’s fieldworker then went to Hebron to document the incident, but when he arrived, the soldiers prevented him for passing through the checkpoint established at al-Shuhada’ street. Although the fieldworker showed the soldiers his ID card and explained the nature of his work, they refused to allow him to enter, as well as Mousa Abu Hashahash, B’Tselem’s fieldworker and Hisham al-Sharbati, al-Haq fieldworker. It should be mentioned that the residents of the area complain about the Israeli soldiers’ and settlers’ harassments as well as preventing human rights organizations from entering the area to publish their complaints. Israeli forces established (6) checkpoints all over the city. At approximately 18:55 on Friday, 29 July 2016, Israeli forces established a checkpoint at the eastern entrance to Qalqiliyah. At approximately 20:00, Israeli forces established a checkpoint at the entrance to Jeet village, northeast of the city. At approximately 18:50, on Saturday, 30 July 2016, Israeli forces established a checkpoint at the entrance Bab al-Hatab village, east of Qalqiliyah. At approximately 19:35, they established a similar checkpoint under the bridge of Azoun village at the bypass road that links between Qalqiliyah and Tulkarm. At approximately 12:10 on Tuesday, 02 August 2016, Israeli forces established a checkpoint at the northern entrance to Ezbet al-Taieb village, east of Qalqiliyah. The soldiers checked the civilians ID cards and searched the cars. Israeli forces established (3) checkpoints all over the city. At approximately 21:15 on Thursday, 28 July 2016, Israeli forces established a checkpoint under the bridge of Eskakah village, west of Salfit. 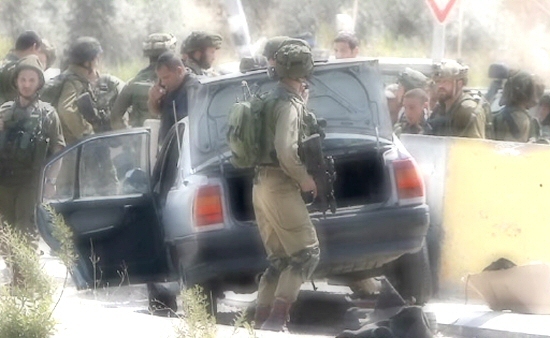 At approximately 15:40 on Sunday, 31 July 2016, Israeli forces established a checkpoint at the northern entrance to Deir Balout village, west of Salfit. At approximately 0:30 on the same day, Israeli forces established a checkpoint at the western entrance to Kafer al-Deek village, west of Salfit. At approximately 13:00 on Friday, 29 July 2016, Israeli forces arrested Mohammed Sadeq Abu Mariyah (16) from Asidah area in Beit Ommar village, north of Hebron, when he was on his way to his house from the village mosque. Mohammed Awad, member of the Popular Committee in the village said that the Israeli soldiers arrested Mohammed the moment he arrived to the village and took him to an unknown destination. At approximately 09:00 on Friday, 29 July 2016, Israeli forces stationed at Za’atarah checkpoint, south of Nablus, arrested Mahmoud Yusuf al-Wadi (34) from Nablus. Eyewitnesses mentioned that the Israeli soldiers stopped the vehicle that Mohammed was in it and checked the passengers ID cards and then arrested Mohammed. At approximately 16:30 on Monday, 01 August 2016, Israeli forces established a checkpoint near the German neighborhood, east of Jenin. They then arrested Abdul Halim Nazih Abdul Halim Yasin (37) from Deir Abu Da’if village, southeast of Jenin, when he was passing via the abovementioned checkpoint. At approximately 15:00 on Tuesday, 02 August 2016, Israeli forces established a checkpoint near Hadad Tourism village, southeast of Jenin. The soldiers stopped the cars and checked the civilians ID cards. When Amro Hamzah Omer Kamil (27) from Qabatiyah village, south of Jenin, was driving his tractor via the checkpoint, the soldiers stopped him, kicked him, arrested him and then confiscated his tractor. At approximately 22:45, Israeli forces established a checkpoint near Sanagal village, northeast of Ramallah, and then arrested Mohammed Zohair Mohammed Khalil form Jaljuliya. At approximately 04:30 on Thursday, 28 July 2016, Israeli forces moved into Wadi Qadoum neighbourhood in Silwan village, south of East Jerusalem. They raided and searched several houses belonging to al-Razem family in the neighbourhood. They then arrested Kazem Mahdi al-Razem (21) and Ramzi Mohammed al-Razem (19). At approximately 11:00, Israeli forces arrested 2 guards of al-Aqsa mosque and summoned an employee from the Reconstruction Committee of the Islamic Endowments (Awqaf) Department because they prevented Israeli settlers from raiding al-Aqsa mosque. An eyewitness said that Israeli forces arrested Hamzah al-Nabali (27) and Hamzah al-Desi (31) and summoned Raed Zughair, an employee in the Reconstruction Committee and, and Feras al-Debs, Head of Media and Public Relation Department in the Islamic Endowments (Awqaf). Dozens of worshipers and guards of al-Aqsa mosque prevented 4 settlers from raiding the mosque from al-Magharbah Gate along with a group of tourists. The settlers then attacked the worshippers. The mosque guards intervened, but the settlers cursed and pushed them. At approximately 04:00 on Sunday, 31 July 2016, Israeli forces moved into Ras al-Amoud neighbourhood, east of the Old City in East Jerusalem. They raided and searched a house belonging to Ismail al-Abasi. They then arrested his son Mohammed (19). At approximately 03:00 on Tuesday, 02 August 2016, Israeli forces moved into Shu’afat refugee camp, north of the Old City in East Jerusalem. They raided and searched several houses and then arrested 4 civilians namely Abdullah Nasser ‘Alqam (47), Ramzi Mohammed Ali (23), Loai ‘Adarbah (22) and Tawfiq Mustafa al-Farhah (26). At approximately 01:00 on Wednesday, 03 August 2016, Israeli forces moved into several houses in Silwan village, south of the Old City in East Jerusalem. They raided and searched a number of houses after which they arrested 4 civilians, including two children and took them to Salah Eden Street police station. The arrested civilians were identified as Montaser Nidal Abu Nab (14), Majdi Mustafa Abu Nab (17), Mohammed Mattar (19) and Sabri Abdul Hafiz Ibrahim (21). An hour later, Israeli forces moved into al-Tour neighbourhood, east of the Old City in East Jerusalem. They raided and searched several houses and then arrested 4 civilians, including 2 children. The arrested civilians were identified as Saif al-Din Maher Abu Jum’ah (21) and his brother Amir (18), Kamal Mohammed Alami (20)and Yusuf Essa Abu Jum’ah (17). At approximately 10:00, Israeli forces arrested engineer Bassam al-Halaq, Head of the Reconstruction Committee Projects in al-Aqsa mosque, and Essa Salhab, a supervisor and two other employees namely Saed Abu Sunainah and Bahaa’ Abu Sbaih. They took them to a police centre near the Chain Gate in the Old City in East Jerusalem. It should be mentioned that the Israeli police escalated its attacks against the Islamic Endowments (Waqf) Department and its employees because they have done some repairs and maintenances inside the mosque. The Israeli forces arrested and summoned 15 workers and guards since the end of lastJune in addition to the obstacles they impose on the repairs in the mosque; the last of which was preventing the restoration of water pipeline near the platform of Burhan Eddin. In the same context, dozens of Israeli settlers protected by the Israeli forces and Special Forces raided al-Aqsa mosque yards from al-Magharbah Gate. Eyewitnesses said that three settlers sat on the ground and began performing their rituals inside the mosque, but the Israeli police moved them out of the mosque after al-Aqsa Mosque guards pressurized them to. On Friday, 29 July 2016, Izzat Kiswani closed down his coffee shop in Sheikh Jarrah neighbourhood in Jerusalem to avoid closing it by the municipality which would also confiscate the contents. Kiswani explained that the court ordered him to close the coffee shop and gave him until the beginning of August to execute the order or they will close it and confiscate its contents. He added that the 180-square-meter coffee shop was built many years ago. Part of it is built from stones and the other is a “barracks”; three families lived off the coffee shop. At approximately 14:00 on Sunday 31 July 2016, Walid Shweiki self-demolished his house in al-Thawri neighbourhood, south of the Old City in East Jerusalem according to the decision of Israeli municipality court to avoid paying a demolition fine of NIS 50,000 for the demolition to the Israeli municipality. Walid added that his house, which is built of tin plates and has two rooms, was built in 2014 and moved-in with his 3-member. The municipality crews previously raided the house several times until a demolition order was issued. Shweiki added that his house is built from “reinforced sheets” and it consisted of two rooms and their facilities. At approximately 04:00 on Tuesday, 02 August 2016, Israeli municipality bulldozers demolished a car shop belonging to Mohammed Aliyan under the pretext of building on a land confiscated for the interest of ILA. Mohammed said to a PCHR’s fieldworker that the municipality crews raided the shop without his presence at 04:00 and surrounded the place. They then demolished it, confiscated some contents and levelled the land without a prior warning. Mohammed also said that the 600-square-meter shop made of wood and has has a 30-square meters room (bus on wheels) which does not need any permits according to the Israeli law. Mohammed Alayan added that the dealership has been established for a year and a half and 6 individuals live off it. He had submitted the required documents to obtain a license. He also said that the municipality confiscated a car and an air condition during the demolishing process. Mohammed estimated that the losses are about NIS 320, 000. It should be mentioned that the municipality crew left a banner in the land saying: “State of Israel- Israeli Lands Department- No Entrance- Violations are on your own responsibility”. At approximately 09:00 on Wednesday, 03 August 2016, Israeli municipality crews demolished three livestock barracks in al-Nabi Samuel village, northwest of East Jerusalem and one of them was used for a women’s organization. Mohammed Eid Barakat, owner of the barrack said to a PCHR’s fieldworker that the Israeli forces surrounded the place and began demolishing three livestock barracks with an area of 220 square meters. One of these barracks was used as a women’s organization while the other for storing agricultural equipment. Both were established in 2011. As for the third barrack, which was used for raising sheep, was established before 1967. Mohammed also said that the Israeli forces prevented him from approaching the place or taking the organization’s contents out of the barrack. He also mentioned that he legally follows the barracks case in the Israeli court, so no demolition order or even a warning was issued against him. At approximately 12:00, Israeli municipality crews demolished a residential caravan belonging to Izz al-Din Abu Nejmah in Wad al-Dam in Beit Hanenah neighbourhood, north of East Jerusalem, under the pretext of building without a licence. Abu Nejmah said that the Israeli bulldozers demolished the caravan which is about 40 square meters where he, his wife and two of his children live. Abu Nejmah also said that the caravan was established in 2014 and since then; he has been trying to obtain a building permit. He lately added wheels to the caravan as the Israeli law stipulate that any facility on wheels does not require a building permit. Abu Nejmah added that “despite that the caravan was on wheels, the municipality bulldozers demolished it without a prior warrant”. Fully detailed document available at PCHR’s official website.